Happy Belated Christmas and Happy NEW YEAR ALMOST. Can’t believe it’s going to be 2014-WEIRD. Time is flying. Hope everything else this week was fantastic for you! 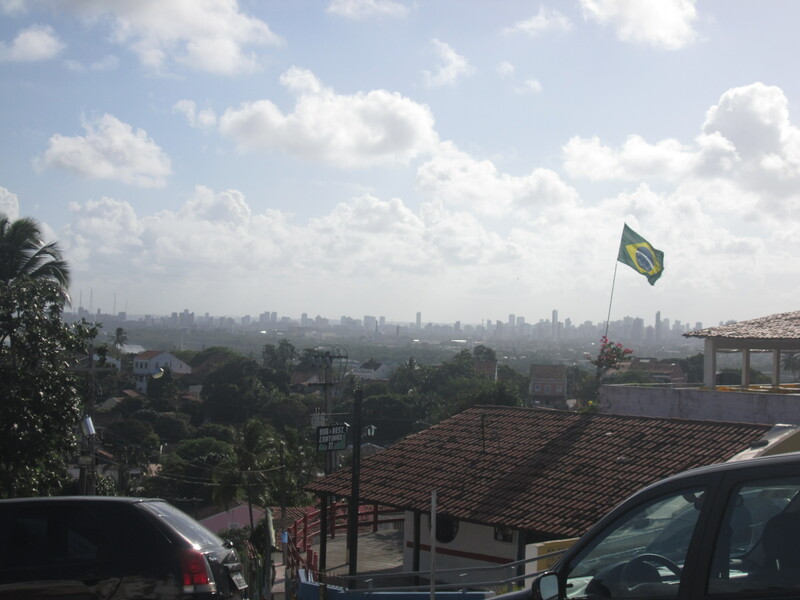 This week we had a lot of almocos at members homes with all of the festitivities of Natal. We also had a zone meeting and didn’t a white elephant gift exchange. haha pretty funny. Afterwards we had a testimony meeting together and that was a special experience. 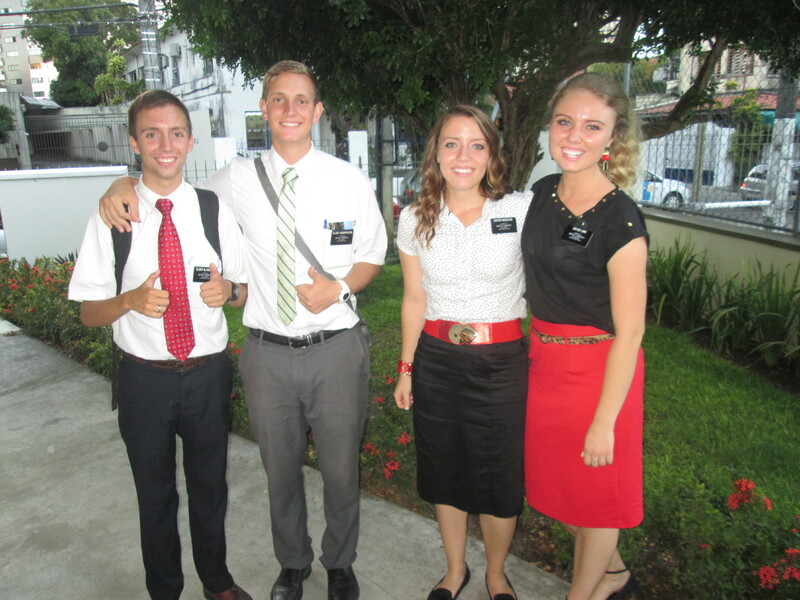 It’s been a while since I had one with other missionaries. I felt like we did that a lot in Michigan-miss that. I know that when we share our testimonies with others we strengthen one another. The spirit is felt and our desire to strengthen our own testimony is stronger. Love that. We also will have another baptism this sunday. We have a new investigator-Idelson who was a reference from a member. He is AWESOME. 50’s, VERRRRRRY chatty/intelligent (more chatty than me and that’s saying something) and really wants to follow the rules. He really respected our religion more and more as he learned how we really value the family unit. And that we know that families are central to Heavenly Father’s plan. He basically said 1st, “So Sisters I want to be baptized.. I just have a few questions first and then I would like to be baptized because I want to be a mormon is that okay?” hahaha. Bless his heart. Something else I was thinking about He also said “now I want the truth when I ask my questions, no lies, just the truth. I want to feel that this is right.”-FEEL THAT THIS IS RIGHT!?? Hellllllllo! How cool is that? Not what is convenient, not what is cool, not what is popular etc. No…he wants to feel that this is RIGHT. I can’t express what a blessing it is to be a Missionary in Christ’s church. I have no doubts, worries, lies, or hestitancies when people ask me for the truth. I’m giving it to them. That’s all I have to give. I am a representative of Jesus Christ and I am here to preach HIS restored gospel. It is truth, the truth in it’s fullness. I know without a doubt that what I am teaching is true, that what I invite investigators to do-read and pray and come to church is how they can know and FEEL that these things are indeed from Heavely Father. It always goes back to that. Many people look to their books, internet, friends, collegues, pastors, teachers etc. for answers. Why not ask the Father of Truth, peace, purity. If we pray and ask God He will answer us. James 1:5. And of course with Moroni’s promise in the Book of Mormon we know that having ask with a sincere heart and real intent having faith in Christ, the truth will be manifested unto us by the power of the holy ghost. And by the power of the holy ghost we can know the TRUTH of all things. Moroni 10:3-5. I can know, Idelson can know, and you can know 🙂 Heavenly Father is always there waiting for us to take that step towards him through that sacred communication we call prayer. Yes. It happened. 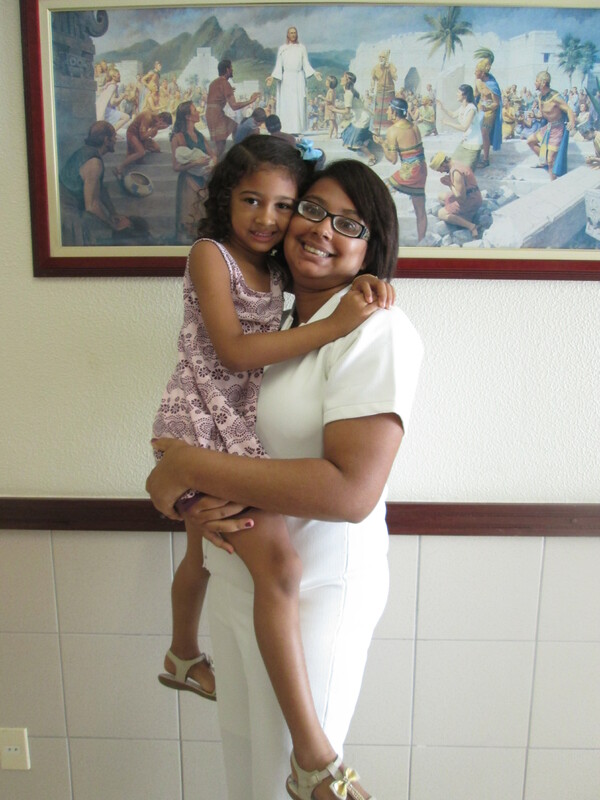 Isabele was baptized yesterday and said she felt clean, relieved and full of peace. YESSSSS 🙂 Pictures attached. Her daughter Anna Luiza (5) is adorable. Seeing her reminds me of Livy-sniff sniff. Mas tudo bem. It is the most rewarding, amazing, joyful event to see someone enter into the waters of Baptism. How eternally grateful I am to be apart of that. I love the work of Salvation-there is nothing like it. With that I’ll leave you with a Feliz Natal. Remember why we have Christmas. CHRIST-mas. He is the reason for the season. Think about what you want to give HIM for Christmas. Not materialstic, but with our hearts….what do you want to give to the Savior this Christmas? I am so eternally grateful for your love and support. For the letters, packages, emails, inspiring words and thoughts. 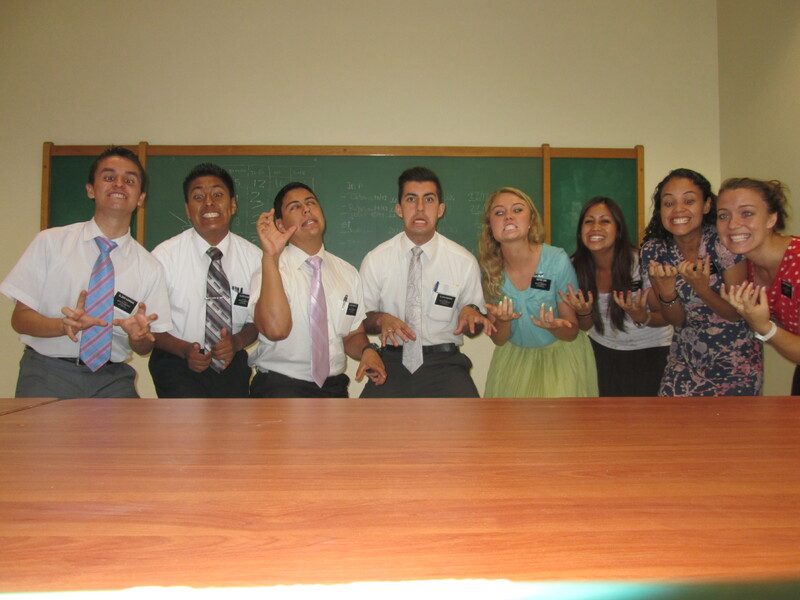 It has enriched my mission experience completely. Thank you. ah I am so happy right now! 1st of all sorry for the delay our p-day was moved today because we’re going to the temple!! SO that’s why I didn’t email you all segunda feira (monday) sorry about that. Yes I am alive and well 🙂 I got 1 package this week from Erika Baker-my awesomazing friend in Michigan and a bunch of letters too from friends and family. THank you all! Chette-happy birthday this saturday! I love you!!! I have to say that the Lord is amazing and His TIMING is real. Yes. Check out this story. So remember Isabele? 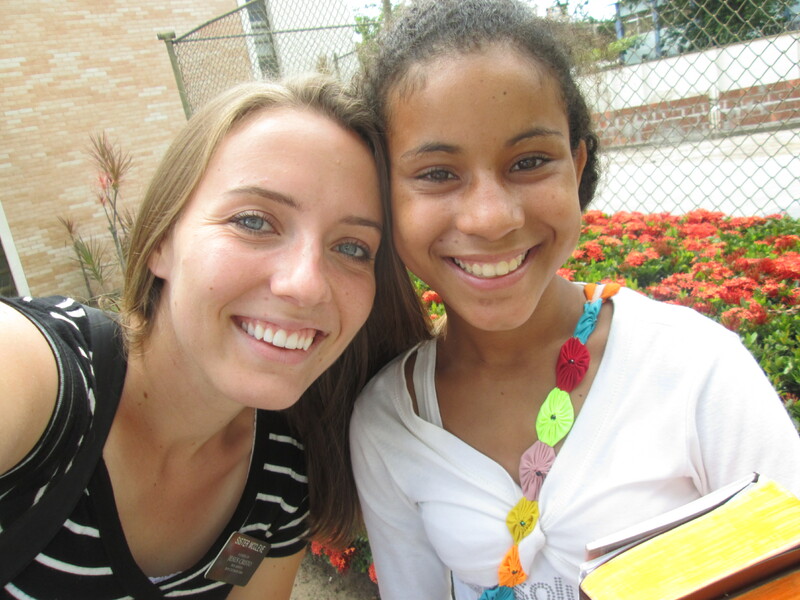 The girl (she’s 24) we found and taught last week for the 1st time/just shared a scripture basically and prayed. So we found her last week sunday the 8th….after the lesson she said we could come back and teach her at home. She said friday was the only day that worked for her… (boo hoo-not for another 5 days! ?-feels like an eternity). So we waited all week hoping and praying she’d be there still/remember us. Well she was and we taught her the restoration. She loved it!!! Seriously, she was totally receptive and just beaming from ear to ear. We invited her to read and pray about our message and to follow Christ’s example by being baptized when she received a confirmation. She accepted. SO sick. Okay, (just wait it gets better) THEN we invited her to church obviously but she told us sadly she couldn’t go because she works sundays from 7-4:30 (for 3 years now by the way) at the restaraunt she works at. Bummer. HOWEVER it just so happened that this weekend (only 1 time per YEAR mind you) was our stake conference. Sooooo we invited her to come to the saturday night adult session with us. She said she’d love to! So we planned to come by the next day to get her and we’d all go to the conference together. She said she’d be ready at 5:30 for us. Okay so obviously the whole night we prayed and the next day too that she’d actually follow through and come. SO the next day (saturday) we’re walking around trying to round up our other investigators to come to the conference and no one could/was home-bummer. It was about 5:15 and we were walking across the street/canal from where Isabele lives. We were going to try and visit some other people first because we had 15 minutes still before we needed to meet her. I looked over the the canal and saw a girl with a cute maxi skirt and a book in her hand waiting outside on the street next to Isabele’s house. I looked more closely and realized IT WAS HER!!! Already waiting for us! AHHHHH! joy 🙂 Anyways so we ended up walking over there and saw her with her Book of Mormon we gave her the day before and she was all dressed up ready to go to the conference with us. MY heart just about died. Seriously. She said she was ready and waiting for us 🙂 SO AWESOME! -this like rarely happens with investigators haha. Anyways so we went to the conference-walking and riding the bus. She was super relaxed and seemed to be enjoying herself. But we got to the stake center way too early-like 45 minutes haha. So we gave her a tour and then ALL of our missionaries in our zone were there and just swarmed her with love along with other members too haha. She liked the session that night a lot-we sat up in front. 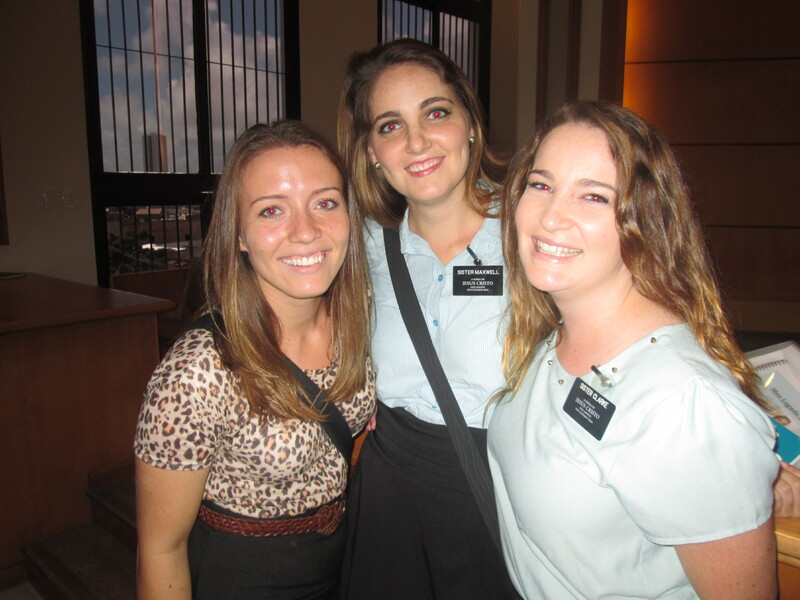 THey talked about member missionary work and temples.Soooo I’m not too sure how much she could understand but she listened the whole time and tons of people talked to her afterwards. YAY fellowshipping!!!! We remembered afterwards that our Zone leaders had 2 baptisms right after so we quickly asked her to stay and watch the baptism. SHe did and loved it 🙂 She said she really wants to go to the Christmas Devotional this upcoming sunday night too-awesome! 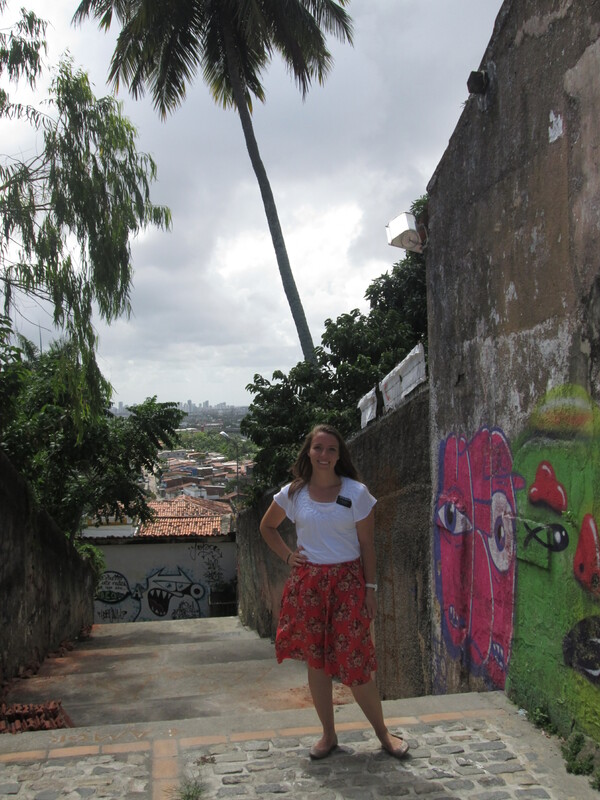 As we walked back home that night after the baptism she asked us tons of questions about us serving missions and the church culture etc. pretty awesome. She really liked everything. We asked if we could come back monday to teach her which she said of course. SO monday we came back with a member (denise-she got back from serving in temple square about 4 months ago-super rad love her) to teach the Gospel of Jesus Christ. 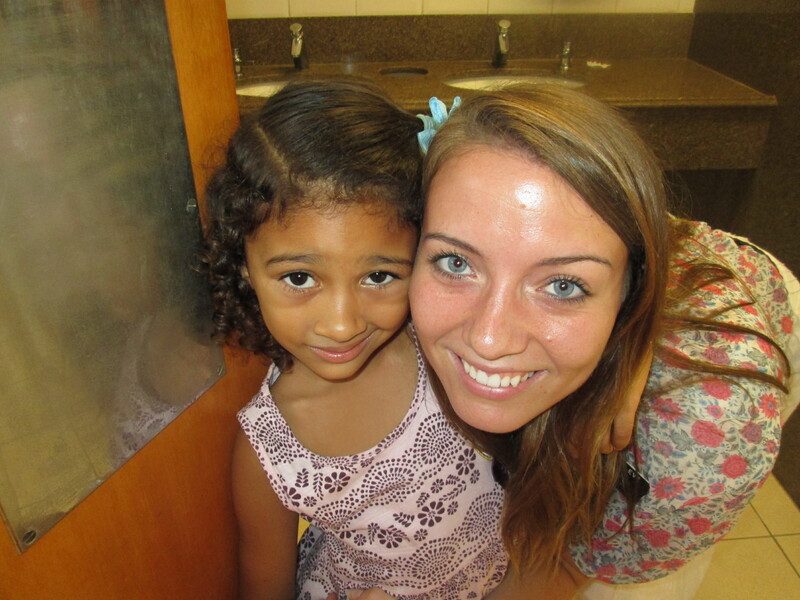 And invited her to be baptized THIS SUNDAY…………..
She said “Simmmm!” with so much enthusiasm and with a huge smile on her face! wahoo! WE have a baptism this sunday! Seriously! And how you might ask? (because remember she always works sundays during church) this sunday happens to be one of her off sundays. She gets one off every 5 sundays and again it happens to be this week. SO really everything has fallen into place! AMazing. I was baring my testimony to her telling her I knew God wanted us to meet her-especially because that week we had fasted and had been praying and praying for miracles. She said that 1st day she saw us she was worried we’d go bug her while she was on the phone (remember I saw her talking on her cell so we decided not to contact her). But after she was very curious about us and decided to go over where we were teaching the other woman and the kids running around. 1 of those kids happens to be her daughter Anna Louisa (5 years old) and normally she lets her play over there and never goes over. But for some reason had a desire to go over there and thats where we happened to be teaching. Amazing. Also her ex husband wants to get back together with her 😦 which means if they live together again we cant baptize her. We taught her the law of chastity yesterday-we fasted and she accepted to live it. RIGHT after we finished teaching her ex walked in to get anna louisa..awkward. Satan is sneaky and he works hard. But we are fasting and praying that this elect daughter will enter the waters of baptism this weekend. She told us that one of her friends already tried talking smack about the church saying “You went to a mormon church? are you nuts? they’re all rich and stuck up…” but Isabele said that she told her friend that she loved being there and people weren’t like that at all. They were friendly and welcoming. She said she felt happiness and joy there. The church is true. Isabele is so prepared and the Lord is preparing the hearts of the children of men to hear His word. I am SO grateful to be apart of miracles in the lives of others. 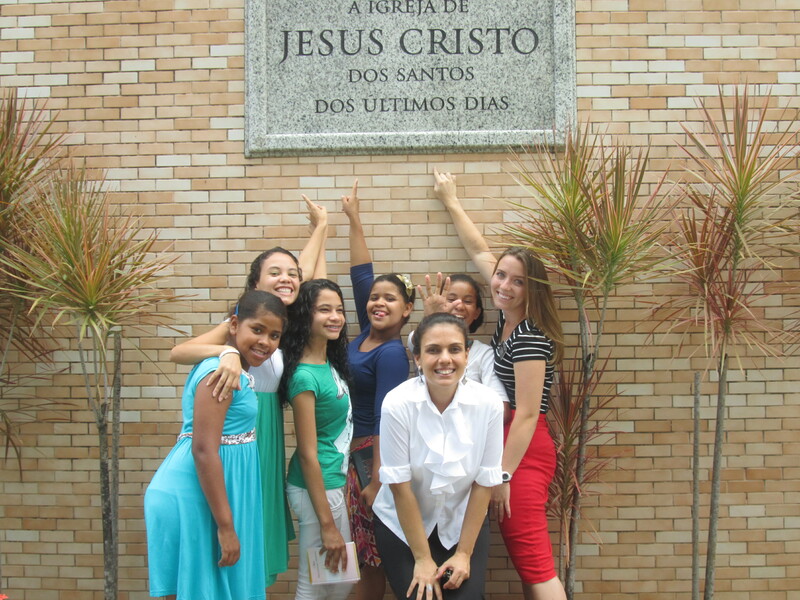 To be “anjos” angels (as Isabele called us in her closing prayer at the end of the lesson) by inviting others to come unto Christ. I am so grateful to my Heavenly Father to serve. I love this work. I love the challenges and the growth and the MIRACLES that happen every day. It is a once in a lifetime experience. IT IS REAL. This is the Kingdom of God we are building. I know that is true. Pictures from our Christmas conference we had this week. FELIZ NATAL! Yes my subject line is true-or at least I think so. It is hot and sizzling here in December-this Christmas weather will be frightful meaning I hope I don’t pass out from dehydration haha. Sounds like everyone is doing just peachy. 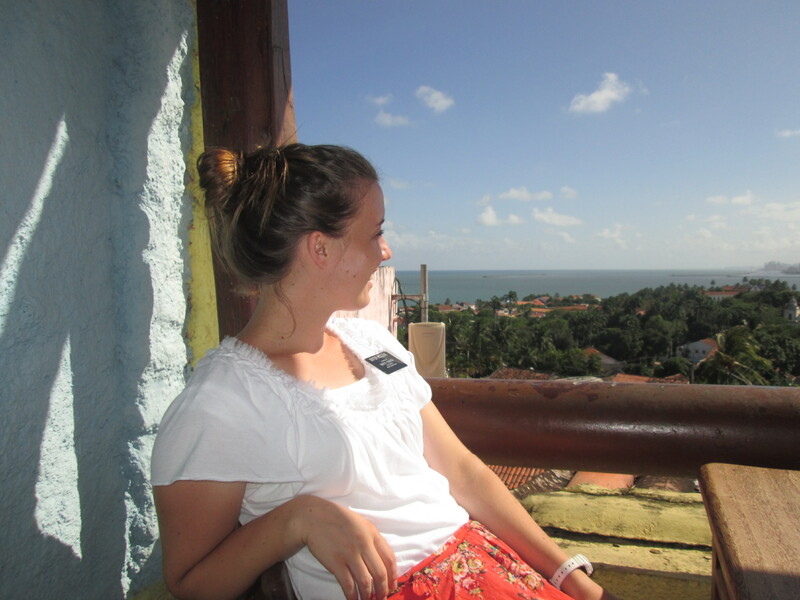 🙂 Good-that is something really nice for a missionary because the work is hard as it is so knowing that everyone at home is doing well brings me a lot of pazzzz (peace). Amo voces. So this week was very up/down like. Basically we find new people to teach and then when we go back to visit it’s impossible to get in contact again 😦 But then we find more new investigators to teach so it’s very exciting. All in all this week was rough-we worked and worked but things just didn’t seem to be rolling in our favor. I guess it was just one of those slower weeks in the mission that you get sometimes. I do have a couple experiences that I’ll share. 2. We found a new investigator yesterday through a personal but cool experience for me. So we couldn’t find anyone em casa yesterday. 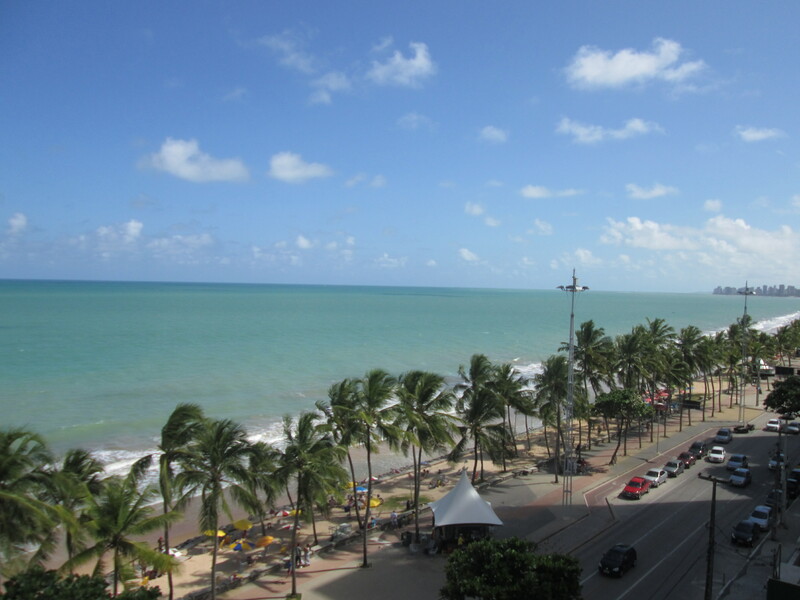 Everyone was gone or drinking in the streets-this is sunday in brazil for ya. So we prayed for motivation and guidance because things just seemed grim. We then decided to knock doors. First one we tried was a straight up rejection-the rudest I’ve had in a while…the thought then occured to me that maybe this was indicator that we shouldn’t knock doors after all. So I told Menezes we needed to pray again. We did and decided to contact a lady who was sitting close by. We walked closer and saw she was on the phone so we kept walking and ended up contacting another woman with 3 kids running around her. Long story short the woman didnt really listen but the other lady we had seen earlier came up to where we were teaching and sat in on the lesson. Her name is Isabelle and her and her husband (probably not legally married) split up 1 month ago. So it’s just her and daughter. 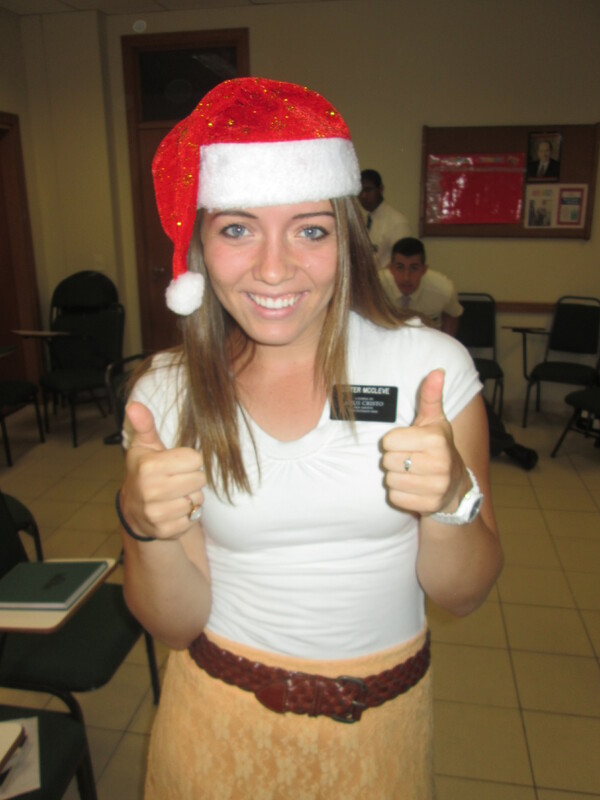 When we offered to come teach her at her home this week she accepted quickly. And later said how excited/happy she was that we were going to come. I know she felt better after talking with us. How grateful I am to be an instrument in God’s hands and EVEN when things look grim we show our faith-keep going and see the blessings come. Happy december! Is it really december? oh my nossa! Seriously it doesn’t even feel like winter/christmas time here. 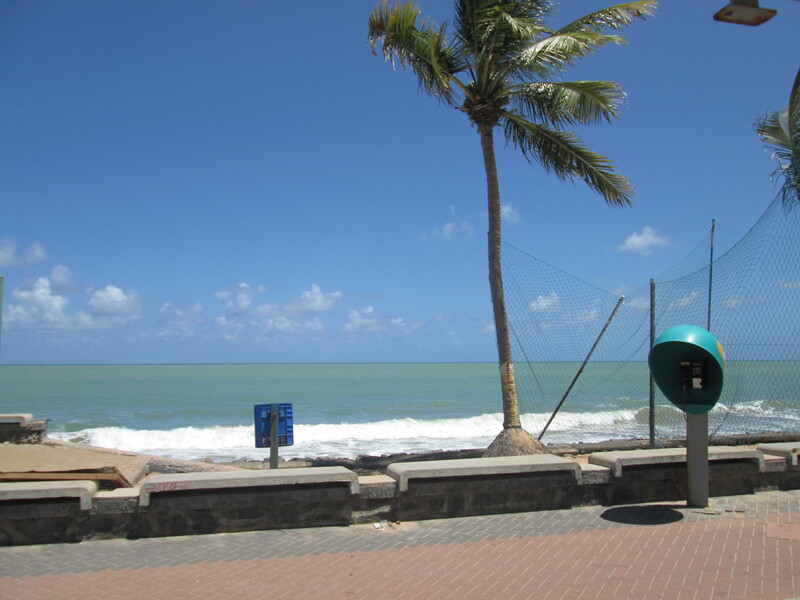 It really is the strangest thing being in a tropical and HOT place during this time of the year. But it’s great! I like experiencing new things! Also happy brithday Grandpa Goodman, Jessica Raban, Holland (and Jeffrey R. Holland by the way haha) and everyone else that I can’t think of right now :). I wish I could be there with you to sing em portugues! Parabens para voce, nesta data querida muitas felicidades muitos de vida! :)) -it sounds way better in real life just so you know. I Love you guys! Okay so this week was good ahh I can’t remember what days were what now sorry. trying to think here…. Pauloma was confirmed yesterday as a member of A Igreja de Jesus Cristo dos Santos dos Ultimos Dias! and received the gift of the holy ghost woo! 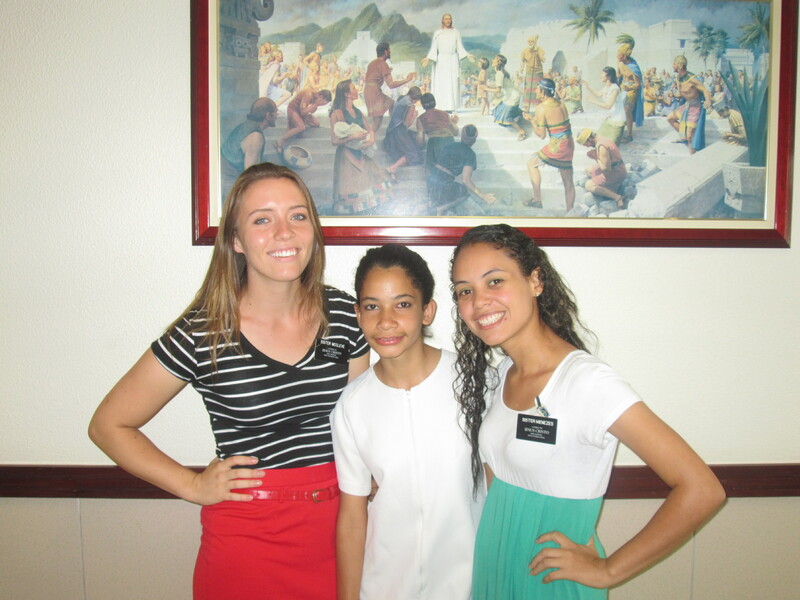 We helped her and the other girls in the ward that are recent converts with personal progress this week. Trying to explain it to them. haha so funny-they are so cute. It’s sad because their families aren’t really supportive/around to help sign off goals and experiences that they do for each young women’s value but they have so much enthusiasm anyways. And the YW president is awesome and helps so much! I want to be a YW leader someday-that would be awesome. I love the youth of this church! This week we’ve found some new investigators which is awesome. Sadly no one on date for baptism. Maria moved? No idea where-to live with her mom I heard…kind of the down side teaching in an area like ours. Things just happen with investigators and you can’t do anything about it….we will continue. That being said no update on Rodigo, we continue to stop by but he’s never hope. Hopes are still high for him and his wife. This week Heavenly Father blessed us with a miracle. So there is officially a new rule in ALL of brazil that we cannot baptize anyone under the age of 15 (unless it’s a family together). Our president said that here in Brazil we’re basically building a giant primary-haha it’s true. So at first we were all shocked/bummed because we do teach a lot of youth it’s true. But at the same time I was thinking the Lord has set this policy up. So He will provide a way for the work to continue and even be strengthed. That being said we decided to really focus on finding and teaching families. Very difficult to do though because a lot of families here are scattered and broken. But that won’t stop us. So the other day sure enough we were going to an appointment and we walked right past a family. My companion stopped to talk to them and I turned around and walked back. Not even realizing it was a family. 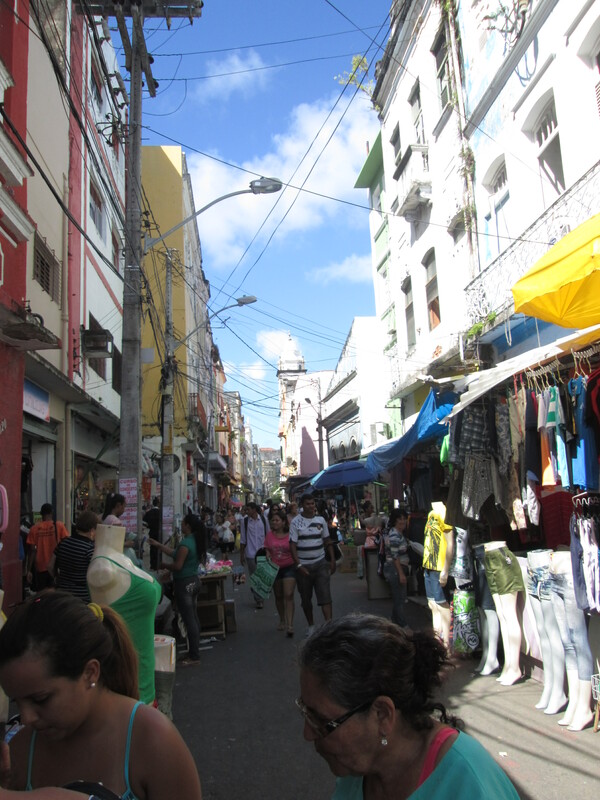 (Brazilians love to socialize so you see a lot of mini groups gathered all the time in the communities here). Yes! 2 kids and a mom and dad who sadly aren’t legally married—EVERYONE here just lives together because marriage is so expensive…it’s tough.But we shared a scripture and talked with them for a bit and we are going back to teach them this week. The mom was wearing a shirt that said “family day” in english so I was asking her about it. Ah! Seriously tender mercy! I really hope they will be home next time we come-I know that Lord wanted us to teach them. They were VERy receptive and open. My companion and I feel really good about them. WE ARE PRAYING THAT WE CAN TEACH AND BAPTIZE THEM! So cool. The other experience we had was teaching a couple who lost 2 sons in the last 2 years. I’m pretty sure because they were involved with drug trafficking-common here in Brazil with rapazes (young men). It’s really sad. The 2 boys were both baptized when they were younger too but never came back to church. There are 3 other kids in the family still lving and one of them-Michiel is baptized. I think the mother and father are very open and receptive because of the emptiness they feel from what happened. We had been visiting less active youth with the YM pres. of the ward a couple weeks ago. Found this family and shared a message with Michiel-the less active son (14 years old). I kept thinking about that family and felt that we should go back. So we did this week and we’re going to start teaching the parents,hopefully with Michiel too. Maria and Israel are their names. You can just see the worry that Maria has for her son Michiel that he too could be torn away from them someday. Oh how badly I want them to see and experience what the atonement of Jesus Christ can do for them. How hearts can be healed, and hope poured into their hearts. I am praying that we will be able to have miracles with them as well. I know that this church is a church of Families. Heavenly Father wants us to return back to Him in our families-happy and united. As cool as it is to teach and baptize individuals…how much more joyful it could be if a family was brought together because of the gospel. I know the gospel of Jesus Christ can do just that. Unite families and bind them together forever even after this life. No one ever to be lost. How grateful I am to know that I get to be with my family together forever. I have to go! 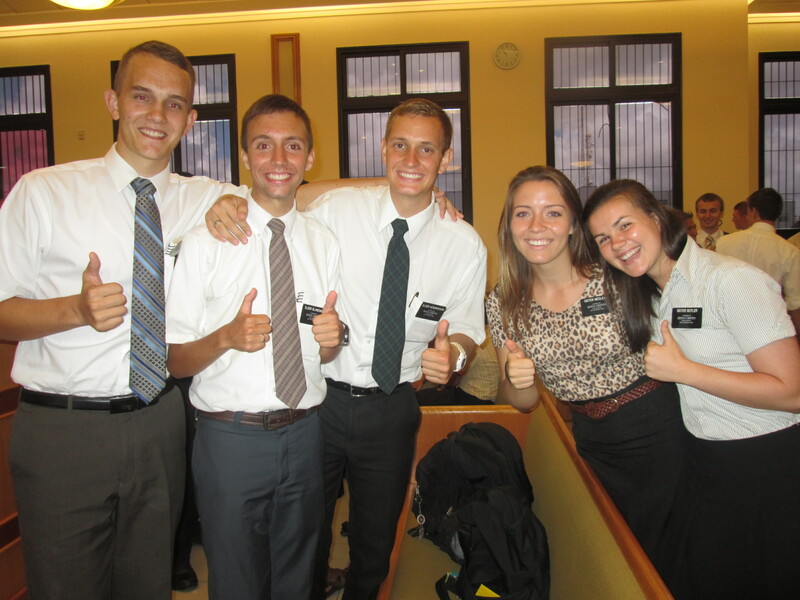 I love you all and am so grateful for the gospel in my life. It is true! I forgot to tell you I sang today with sister Maxwell at transfers today. 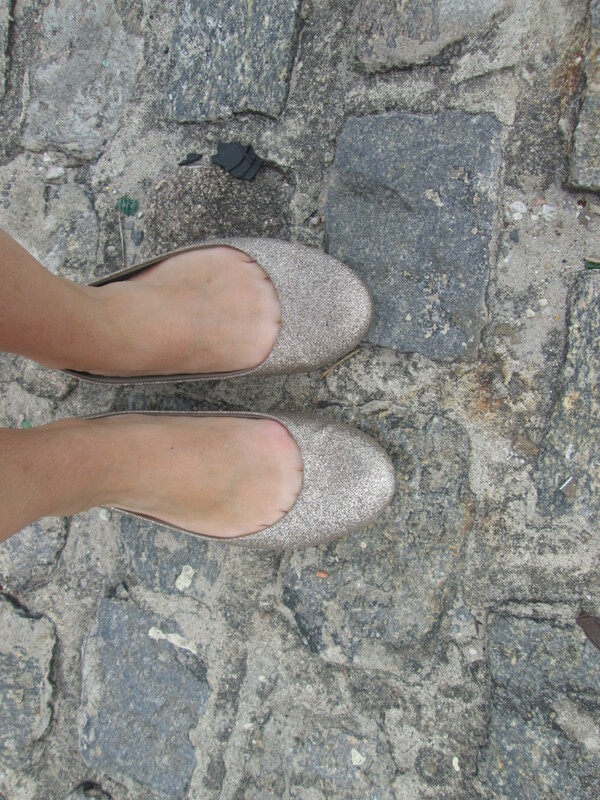 I am staying in Setubal with Menezes we only went to transfers just so I could sing. 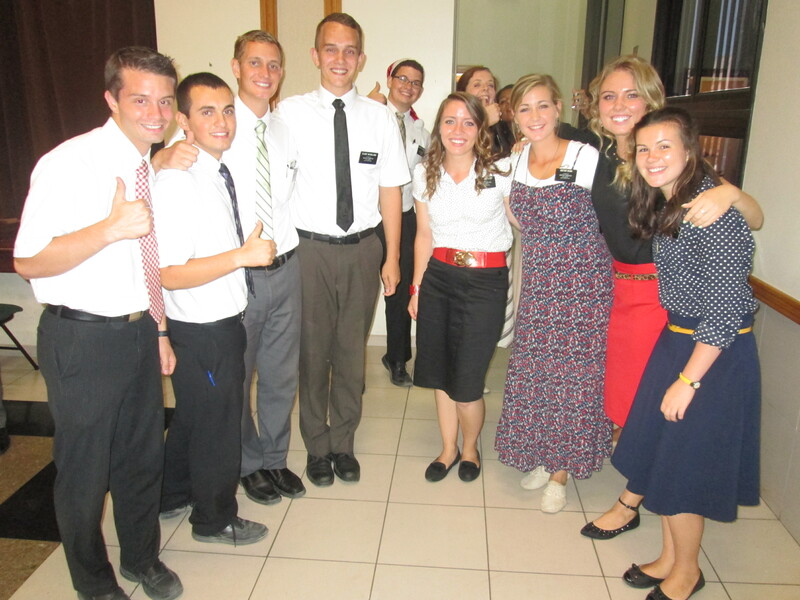 I got to see people from my MTC district and sister Kron!-Geoffrey! Hi family. I love you guys. This week was funny. Great but funny. 1st of all we had Pauloma’s baptism! Wooo! I already sent photos. It was awesome she was sooo cute and happy and she said she felt so good. She will be confirmed next week! Wahoo! this week our mission had 209 baptisms including ours! haha so sweet! SO AGUA!!!! Love it. The work is sweet. ]Anyways we also had some sweet things happen this week. I’ll start with Rodrigo. So we met Rodrigo last week knocking doors which he came and we talked with him. He goes to the evangelical church and is VERY active in that with his wife. However he seemed open to us as we talked and shared a couple scriptures with him do Livro de Mormon. We asked if we could come back and bring him a copy and teach him more to which he agreed. He told us that he knew God had sent us to him that day and was grateful. So this week we were walking in the same neighborhood after just finishing another lesson. A car pulled up by us and inside was Rodrigo asking “hey when are you guys gonna bring me that book? I’ve been waiting” haha it was funny, we were shocked we told him we’d come in a few minutes after he returned home. We went over and taught him the restoration. He was super receptive and asking questions that we answered. Apparently he has cousins that are LDS and active so he already knew a little bit about the church. As we closed and invited him to read and pray he said he definitely would without a doubt. He told us that the first time we met him he had been praying for help and guidance from God and then later that day we knocked on His door.SWEET. Then the 2nd time he was really sad and discouraged especially with church and wasn’t sure what to do when he saw us walking and stopped us asking us when we’d bring him that book. He said that He knew God was putting us in His path because he had been praying for help. And we were that HELP!!!! So anyways after we finished the lesson he gave the closing prayer and in the prayer he said “…Heavenly Father thank you for sending these girls to help me in time of need. I know that what they have to share is important and can help me. Please help me as I read and pray about these things that I can receive an answer if they are true…” he also asked God to help0 him not give up on church.So clearly we came at the right time. We are excited to follow up with him and hopefully meet his wife this week. He wasnt at church sunday BUT we are hopeful. Seriously the Lord is amazing. 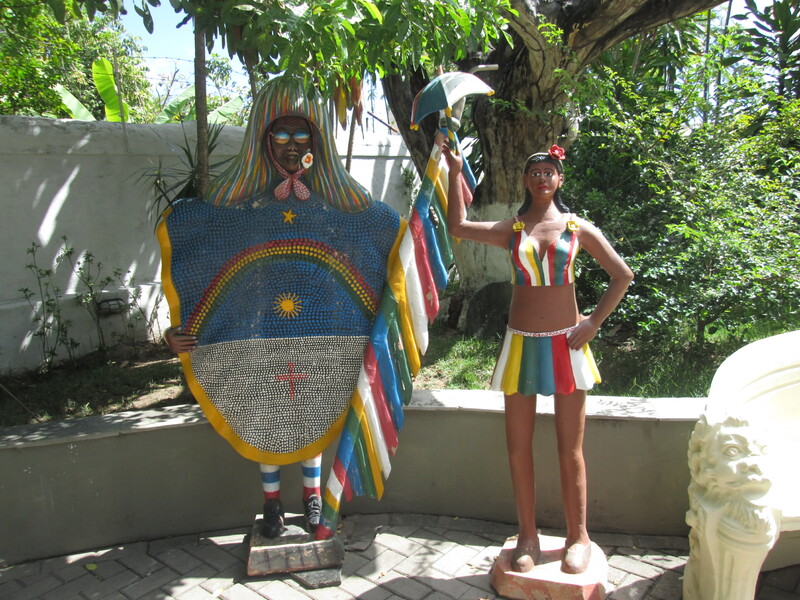 So Maria was the other menina (young girl) that originally wanted us to teach her along with Pauloma. But she wasn’t progressing while Pauloma was so we stopped teaching her since she seemed indifferent and wasn’t keeping comittments. We decided to go visit her after fasting speficially to know what her needs are and how we can help her. We did and had an awesome lesson on the gospel of Jesus Christ. Faith, repentance, baptism, receiving the gift of the holy ghost and enduring to the end. She seemed like she was paying attention but still she seemed very stand off-ish. Finally at the end as we were wrapping things up (I was honestly bummed because she seemed the exact same) she said “I have a question…what does it mean to be saved?”. Honestly, at that moment it was as if the light went on inside her. The spirit was there as we explained about our Heavenly Fathers plan for us and how living the gospel (what we just taught) is the way back to Him. We invited her to read and pray about what we taught which she accepted. And invited for baptism next month which she accepted. It was amazing. 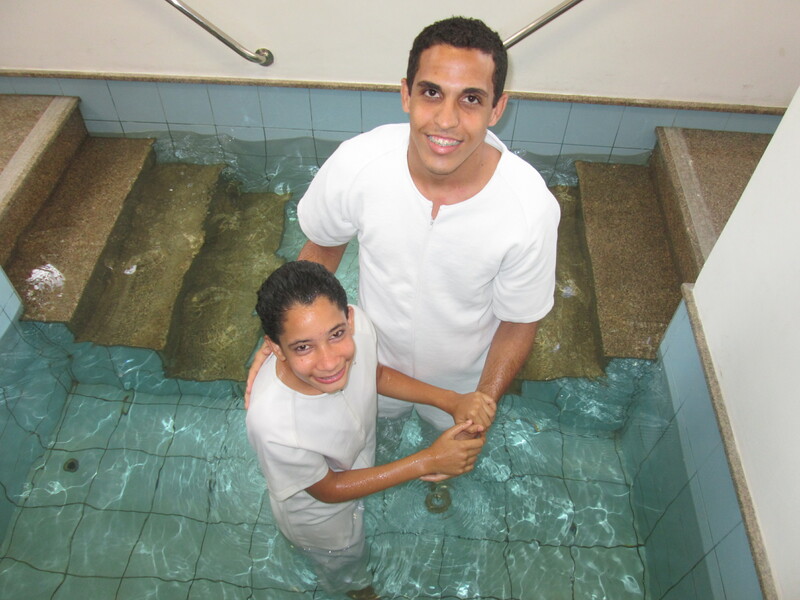 She had already accepted baptism before with Pauloma but didn’t feel ready. But after talking about the importance of baptism and what it really means she had a better understanding and knew it was an essential part of salvation. So cool to watch. I wish you could all have been there. We went to visit her a few days later and her countenance was so different. She was EXCITED to see us and said she was waiting for us when we’d come back. 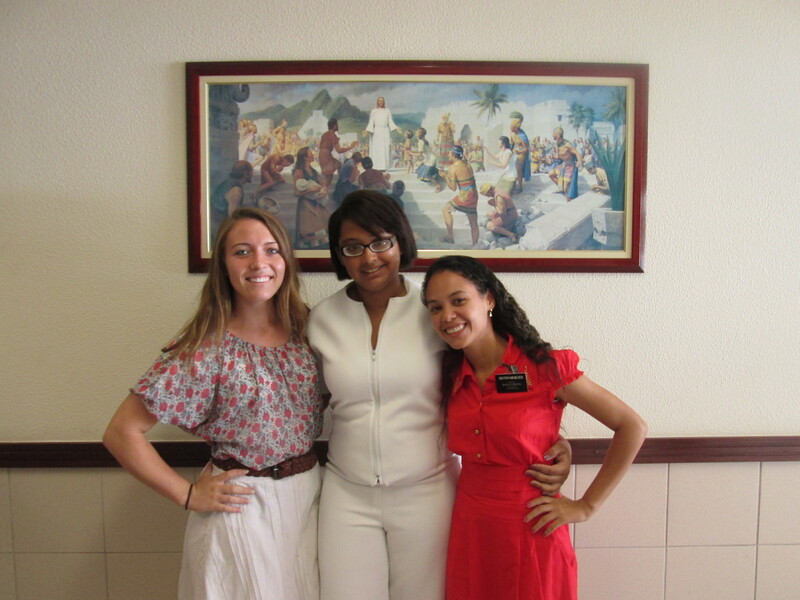 She told us she read ALL of the pamphlet that we had left with her and in the Book of Mormon too. She said her favorite part she read was about baptism and receiving the holy ghost.She was so cute and excited about it. Ahhhhh 🙂 Ya, I was beaming 🙂 It was like being an efy counselor again. 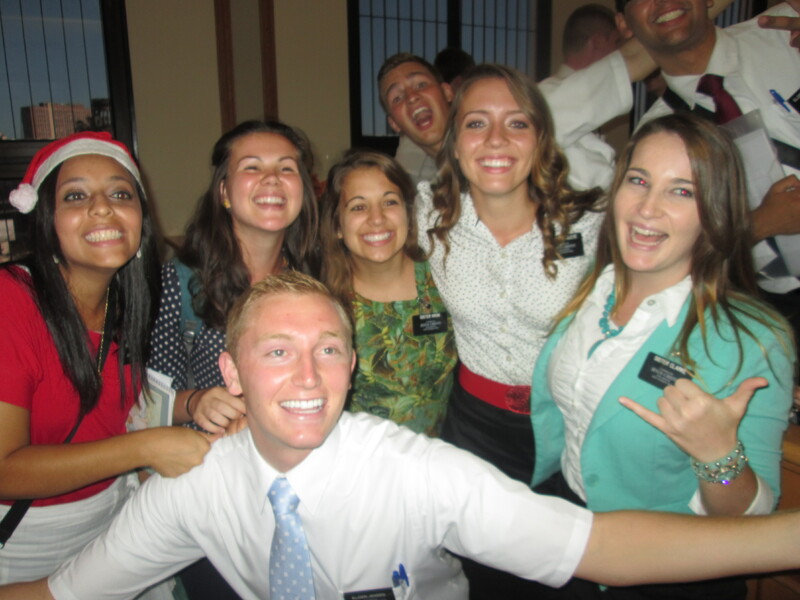 Man, I love being a missionary. Love you all, have a wonderful thanksgiving week-I will try to find a turkey somewhere to eat haha. Oh by the way this week was funny because after marias awesome lesson menezes and I got sick. We took turns using the bathroom all night. Food poisoning from something we had. Anyways so that was funny because we had an awesome day but we got so sick afterwards….I don’t know I just thought it was funny. Okay I’m done now 🙂 haha love you all! Thank you for the letters you’ve been sending both emails and snail mail I get a lot every p-day and received awesome letters this week from family and friends. thank you all! 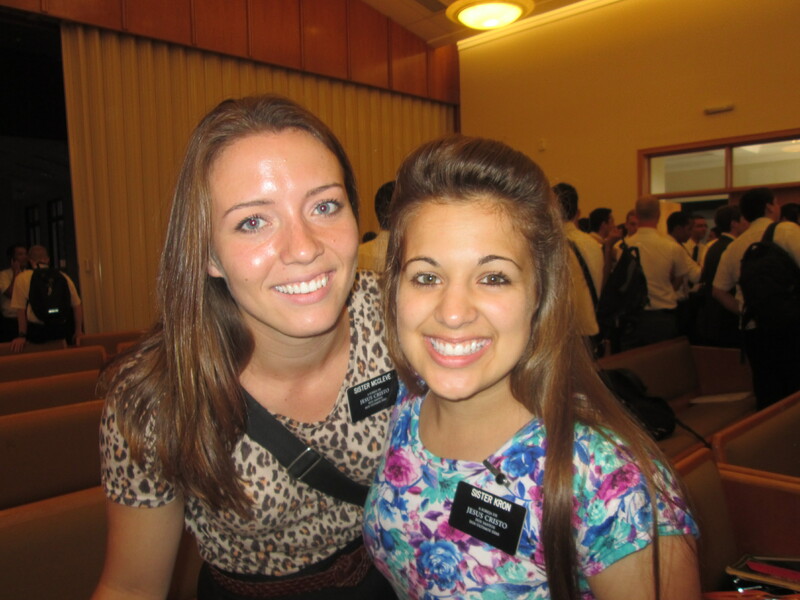 I love being a missionary and witnessing people coming unto Christ. What a privelage, what a blessing. It’s these times, these moments that make all of the difficulties/challenges in a mission worth it. I love the Lord, in Him my soul delights. Jacqui! 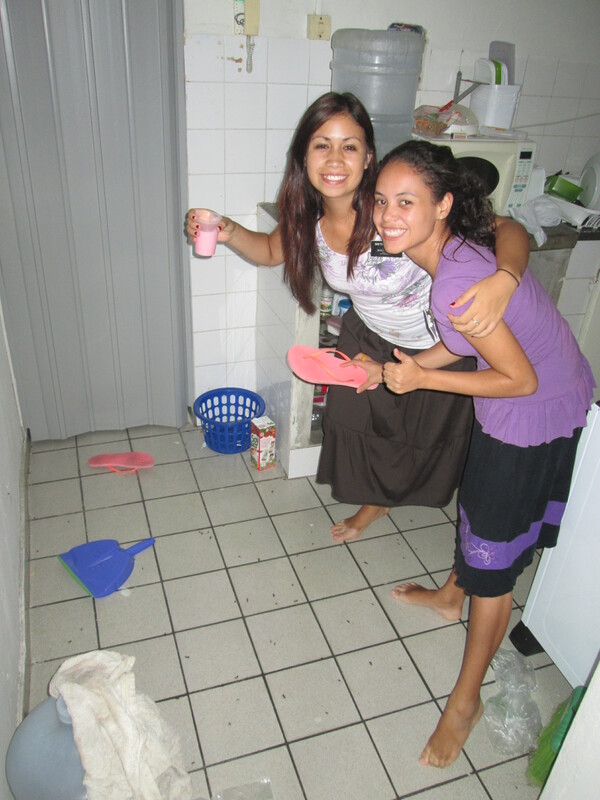 The recent convert who invited Pauloma to be taught by the missionaries ya member missionary work! 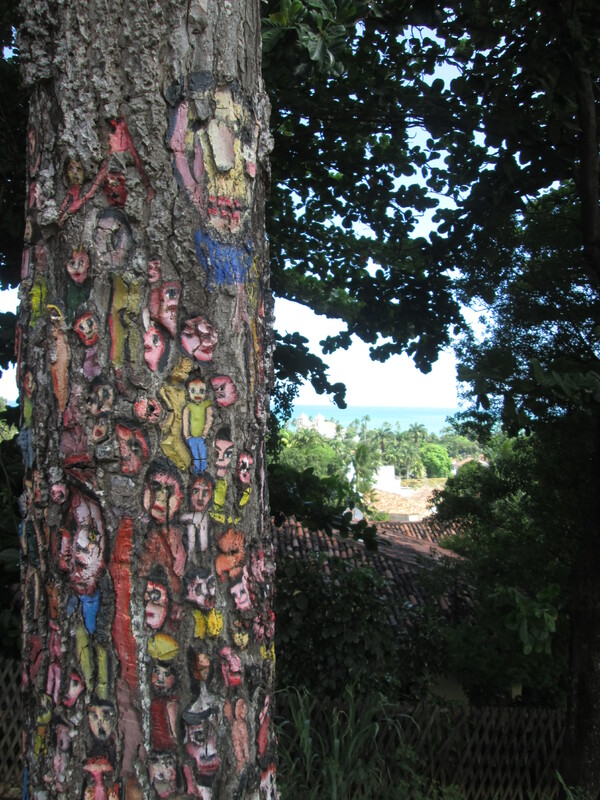 Olinda, one of the most beautiful places in the world. 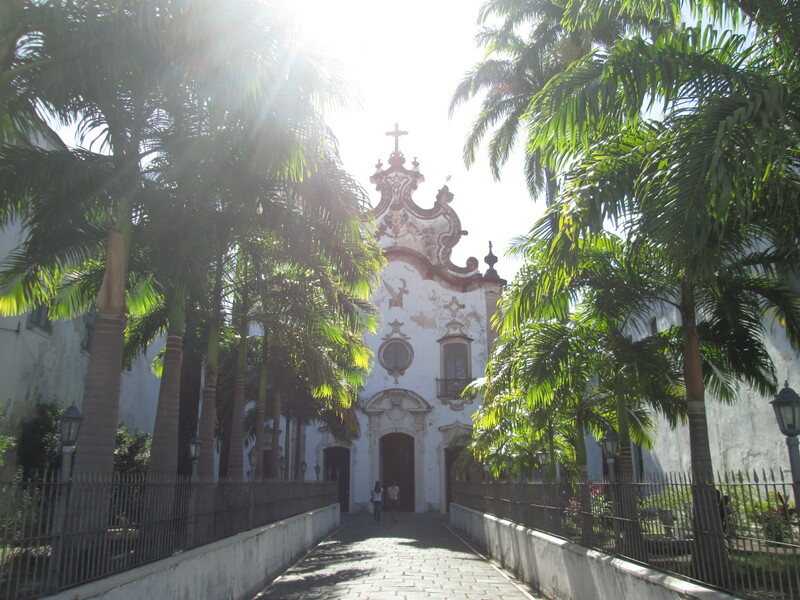 A mixture of old europe-roads, buildings, history and a tropical kick with the sun-bright blue/green water and the forestry WITH palm trees. Man I love you guys! Seriously I LOVE knowing that I will receive emails from family and friends….you are all so good to me. Thank you. Okay this week was sweet. On tuesday as a district we decided to fast to have miracles-for baptism. We had a long trip back by bus and I was pondering and praying about our fast. As we returned to our area Sister Menezes and I were out stopping by investigators and contacting (what we do everyyyyyyy day). We had been doing so for about an hour and all of a sudden we heard “SIsters! SIsters!! 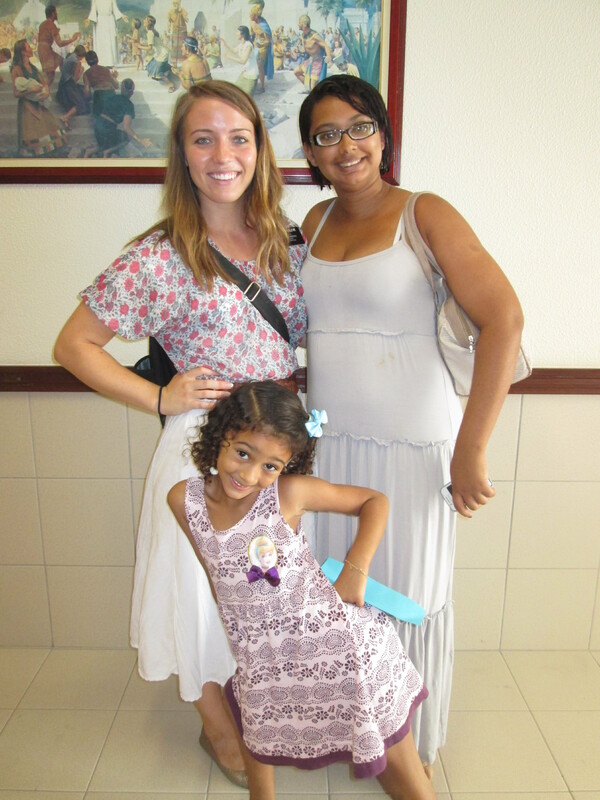 !” we turned and saw Jaquelini-a recent convert (shes 13 years old) running up to us with a big smile on her face. SHe told us she has 2 friends that want to us to teach them and be baptized! We went and met them Pauloma e Maria (12 and 14 years old). We ended up teaching them the restoration and they accepted the invitation to be baptized on the 24th of this month! I could tell Maria was hesitant and seemed more indifferent. But Pauloma was gazing at us as we taught. I knew she was totally prepared and elect. MIRACLE!!!!! Since then we’ve taught her several times (sadly not maria as much). She even came to mutual as well with Jaqui last week. The activity was about modesty and the clothes we should wear to show respect and appreciation for ourselves and our bodies that Heavenly Father gave us. 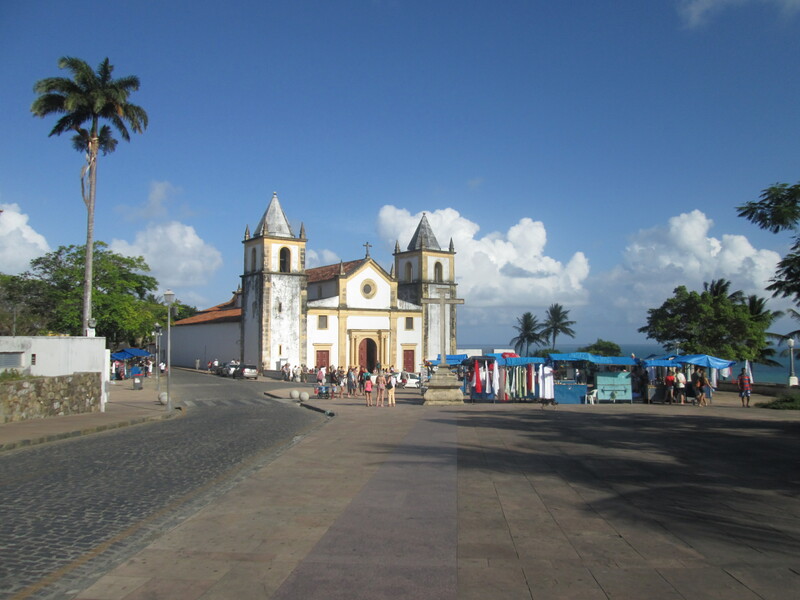 As wonderful as it was I could tell Pauloma felt uncomfortable and seemed discouraged since her clothing was a little immodest (welcome to Brazil). Sunday came along and we discovered Pauloma wasn’t at church even though she had said all week how excited she was. We found it was because she said she didn’t have the right clothes for church so Jaqui went along to church without her. 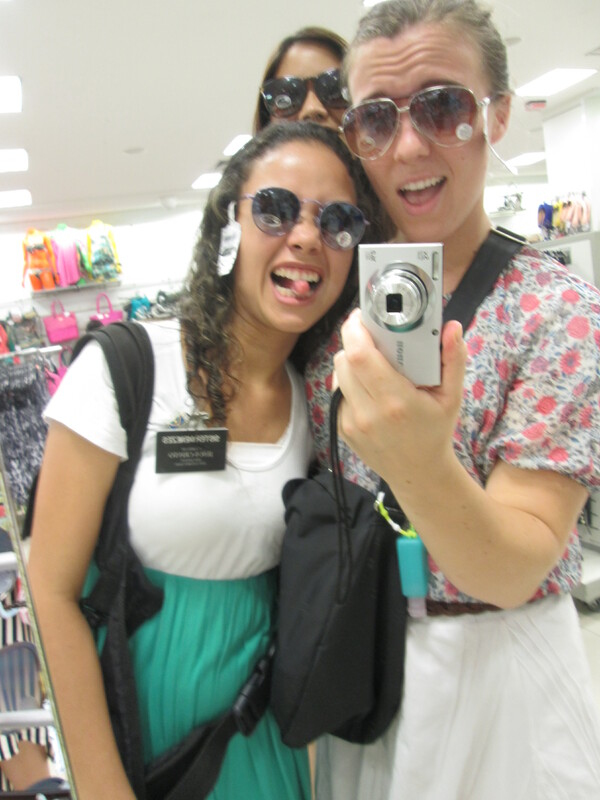 Sister Menezes and I knew how much she wanted to be at church and that we had to do something to help. We ran home grabbed some clothes (thank heavens my companion is TINY) and went to Paulomas house. SHe told us she couldn’t because of not having clothes ready and her mom wanted her to stay home at the house with her brother while she was out?? Something along those lines (no, I can’t understand portuguese word for word perfectly yet haha). We talked with her and told her we brought some cute outfits for her to try on-to which she responded (her curiosity was peaked-so cute) she wanted to see. She ended up trying on a dress she really liked and we expressed how cute she looked and how great it was if she came to church with this outfit too she finally smiled and said….”eu vou” (I’ll go) AHHH she was so cute. i love her so much. And she loved church! She is reading the book of Mormon even though she can’t read very well. All I can say is that she is so prepared and is a miracle that fell into our laps. SHe has such a desire to do what is right and to learn more and more of the gospel even though she’s just 12. I can feel it from her every time I am around her. So humble and sweet-wanting to follow Jesus Christ 🙂 Her baptism is this sunday! Woo! FASTING WORKS! ANd so does member missionary work. Jaqui’s only been a member for 3 months. 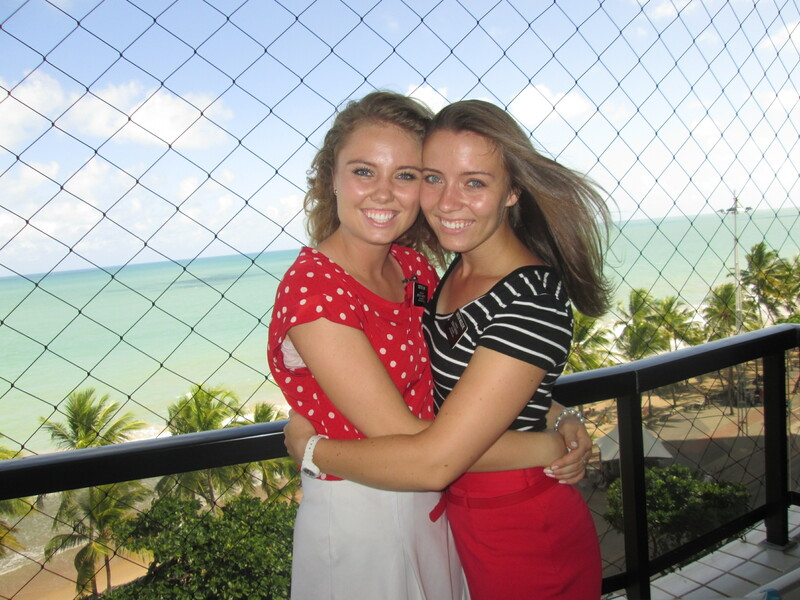 I know my cousin Kate has a couple friends who have also been baptized because of her example and friendship. 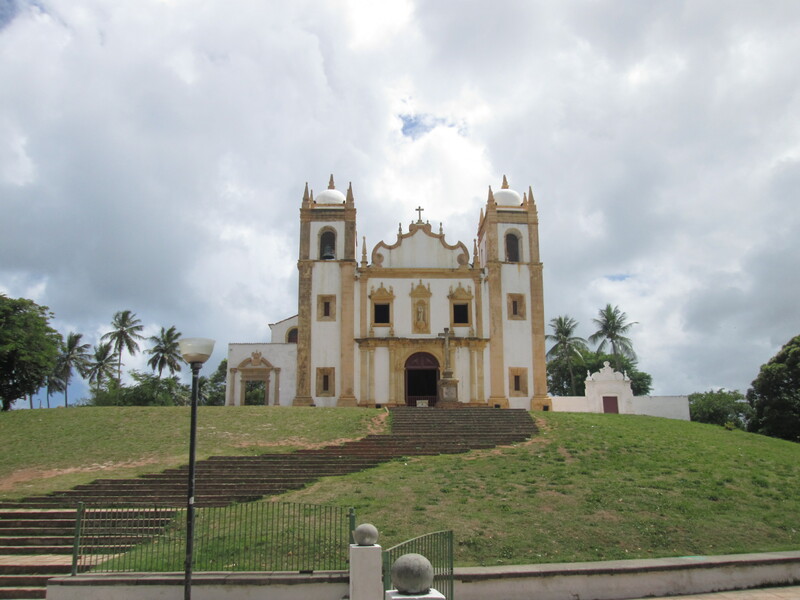 Let us NEVER forget what examples we are as members da Igreja de Jesus Cristo dos Santos dos Ultimos Dias! Yes. I love this work. As hard as it is-day in and day out walking, talking, finding, teaching, and still there’s no baptisms or reactiviations or people coming to church. Well in the words of elder Holland who I love so much ; Missionary work is not easy because salvation is NOT a cheap experience” amen. I love you all. My testimony of fasting and DILLIGENCE-keep working even when you feel unsuccessful the blessings do come. SO my dearest family and friends KEEP GOING. Trust in the Lord and you will see His hand. I know this is true.